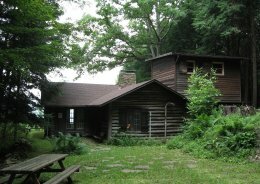 Pfeiffer Nature Center & Foundation Inc.
Pfeiffer Nature Center, 1974 Lilibridge Road, Portville, New York, has open access hiking trails, a historic log cabin, great birding areas and a picturesque pavilion available for rent. 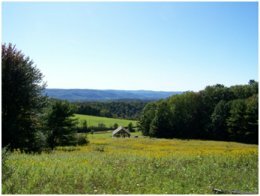 Located in rural southwestern New York, the Center is located on more than 648 acres of rural landscapes among old growth forest. A variety of guided hikes and outdoor activities are scheduled throughout the year. The Woods, Walk & Trail Run, is held every year. For a full list of scheduled activities please view their calendar. The Lillibridge Property consists of 188 acres of forest and has a rustic American chestnut log cabin listed in the National and State Registers of Historic Places. Sitting at the front of the cabin you have a spectacular panoramic view of both nearby farms and distant mountaintops. A timber frame pavilion offers a covered shelter for weddings, reunions, graduations and other events overlooking the meadow and mountains. Group tours of all ages are welcome. A variety of organized nature-based activities are available. Reservations must be made in advance for group tours. The Pfeiffer Nature Center also offers a handicapped interpretive trail. Over nine miles of public trails are open from dawn until dusk daily.